Financial aid packaging involves employing strategies to distribute limited financial aid resources to qualified students to attend the postsecondary school of their choice. 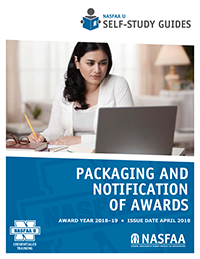 The packaging process combines various types of Title IV and non-Title IV aid from federal, state, institutional, and private entities, to help meet the financial need of college students. Rules for packaging some Title IV aid are different from the rules for packaging non-Title IV aid. This guide will walk you through the options and teach you how to employ various packaging methods. Know the foundational principles and guidelines of packaging. Recognize calendar terms and key concepts related to packaging. How to use packaging processes that meet the institution's policies for awarding student aid. Award notification requirements and options.